Song Dynasty portrait of an Imperial examination. The Imperial examinations or Keju (Traditional Chinese: 科舉; pinyin: kējǔ), were an essential part of the Chinese government administration from their introduction in the Han Dynasty (206 B.C.E. to 220 C.E.) until they were abolished during Qing attempts at modernization in 1905. 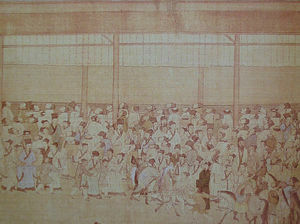 The examination system was systematized in the Sui Dynasty (581–618) as an official method for recruiting bureaucrats. It was intended to ensure that appointment as a government official was based on merit and not on favoritism or heredity. Theoretically, any male adult in China, regardless of his wealth or social status, could become a high-ranking government official by passing the imperial examination. Examinations were given on four levels, local, provincial, metropolitan and national. Candidates on their knowledge of the Confucian classics, their ability to write, and the "Five Studies:" military strategy, civil law, revenue and taxation, agriculture, and geography. Though only about 5 percent of those who took them passed, the examinations served to maintain cultural unity and consensus on basic values and ensured the identification of the educated elite with national, rather than regional, goals and values. The Chinese civil service system later served as a model for the civil-service systems that developed in other Asian and Western countries. The first centralized Chinese bureaucratic empire was realized under the Qin Dynasty (Ch'in dynasty; 秦朝; Ch'in Ch'ao) (221 B.C.E. - 206 B.C.E.). Appointments to the Qin bureaucracy were based on recommendations from prominent aristocrats and existing officials, and it was commonly accepted that candidates must come from the aristocracy. The origin of the civil service examination system, called the nine-rank system, can be traced to the Han Dynasty (206 B.C.E. to 220 C.E.). In 124 B.C.E., during the reign of the Han emperor Wu-ti, an imperial university was established to train officials in the principles of Confucian government. The Sui Dynasty (581–618) adopted the Han examination system, systematizing it as an official method for recruiting bureaucrats. The Sui introduced a rule that the officials of a prefecture must be appointees of the central government rather than local aristocrats, and that the local militia was to be subject to the officials appointed by the central government. During the T'ang dynasty (618–907), a system of local schools to prepare scholars for the civil service examinations was established. Those who hoped to enter the upper levels of the bureaucracy then competed in the chin-shih exams, which tested their knowledge of the Confucian Classics. These examinations gradually became the major means of selecting government officials; by the end of the T'ang dynasty, the old aristocracy had been supplanted by the scholar-gentry. The civil-service system reached its summit during the Sung dynasty (960–1279). Throughout China, public schools were established for the benefit of those who were talented but indigent. Officials related by blood or marriage were forbidden to engage in business together, and members and relatives of the imperial family were not allowed to hold high positions. A merit system was established, in which anyone who nominated an individual for a promotion was held completely responsible for that person's conduct. Higher-level Sung officials were recruited by passing the chin-shih degree. After 1065, the chin-shih examinations were held every three years, and were open to anyone who had passed the qualifying tests on the local level. The civil-service system reached its final form under the Ming dynasty (1368–1644), and was adopted almost intact by the succeeding Qing dynasty (1644–1911/12). No official was permitted to serve in his home district, and officials were rotated every three years to prevent hem from building up a power base. The civil service examinations were given in three stages: the hsiu-ts'ai (“cultivated talent”), held at the local-prefecture level; the chü-jen (“recommended man”), held at the prefectural capital; and the chin-shih, held at Peking. Passing the chin-shih was the requirement for high office, but the other degrees gave privileges, such as exemption from labor service and corporal punishment, government stipends, and admission to upper-gentry status (chü-jen). The subject matter of the examinations was limited to the Four Books and Five Classics of Confucianism. Regional recruitment quotas were set to prevent any one region from predominating, and precautions were taken against cheating. The form for an examination paper became the stylized “eight-legged essay” (pa-ku wen-chang), which had eight main headings, used 700 characters or less, and dealt with topics according to a certain set manner. By 1370, the examinations lasted between 24 and 72 hours, and were conducted in spare, isolated examination rooms; sometimes, however, it was held in cubicles. The small rooms featured two boards which could be placed together to form a bed, or placed on different levels to serve as a desk and chair. In order to obtain objectivity in evaluation, candidates were identified by number rather than name, and examination answers were recopied by a third person before being evaluated to prevent the candidate's handwriting from being recognized. The examinations were often criticized because the ability to do well on the examination did not necessarily reflect the ability to govern well, and because they gave precedence to style over content and originality of thought. The Confucian examinations were finally abolished by the Qing dynasty in 1905 as part of its modernization program, and the civil service system was overthrown along with the Qing government in the Revolution of 1911. The short-lived Taiping regime was the first in Chinese history to admit women as candidates in the examination system. After the fall of Qing Dynasty in 1911, Dr. Sun Yat-sen, the leader of the newly risen Republic of China, developed similar procedures for the new political system through an institution called the Examination Yuan, although this was quickly suspended due to the turmoil caused by regional warlords and the Japanese invasion between the two World Wars. The Kuomintang administration revived the Examination Yuan in 1947 after the defeat of Japan, but moved to Taiwan two years later after the Communist Party of China's victory in the Chinese Civil War. The Examination Yuan continues to exist as one of the five branches of government in the Republic of China on Taiwan. Theoretically, any male adult in China, regardless of his wealth or social status, could become a high-ranking government official by passing the imperial examination, although under some dynasties members of the merchant class were excluded. In reality, since the process of studying for the examination tended to be time-consuming and costly (if tutors were hired), most of the candidates came from the small group of relatively wealthy land-owning gentry. However, there are a number of examples in Chinese history of individuals who moved from a low social status to political prominence through success in the imperial examination. Under some dynasties the imperial bureaucracy became corrupt, examinations were abolished and official posts were either sold or given as political rewards. At these times, the public morale diminished, and some type of reform was often introduced to restore traditional Confucian values in the government. In late imperial China the examination system and associated methods of recruitment to the central bureaucracy were major mechanisms by which the central government captured and held the loyalty of local elites. Their loyalty ensured the integration of the Chinese state, and countered tendencies toward regional autonomy and the breakup of the centralized system. The examination system distributed its prizes according to provincial and prefectural quotas, which meant that imperial officials were recruited from the whole country, in numbers roughly proportional to each province's population. Elite individuals all over China, even in the disadvantaged peripheral regions, had a chance at succeeding in the examinations and achieving the rewards of holding office. The examination system also served to maintain cultural unity and consensus on basic values. The uniformity of the content of the examinations meant that the local elites and political aspirants across the whole of China were inculcated with the same values. Though only a small fraction (about 5 percent) of those who attempted the examinations passed them and received titles, the preparation for and the hope of eventual success on a subsequent examination sustained the interest of those who took them. Those who failed to pass—most of the candidates at any single examination did not lose wealth or local social standing; as dedicated believers in Confucian orthodoxy, they served, without the benefit of state appointments, as teachers, patrons of the arts, and managers of local projects, such as irrigation works, schools, or charitable foundations. In late traditional China, education was valued because success in the examinations assured upwards social mobility. The overall result of the examination system and its associated program of study was cultural uniformity and the identification of the educated elite with national, rather than regional, goals and values. This self-conscious national identity still underlies the nationalism that has been so important in China's politics in the twentieth and twenty-first centuries. Examinations were given at the local, provincial, metropolitan and national levels. District exams tested candidates on their knowledge of the Confucian classics, and their ability to compose poetry on given subjects using set poetic forms and calligraphy. The provincial level examinations tested candidates on the breadth of their knowledge of the Classics. A candidate who passed the provincial level exam was termed juren (recommended man) and was eligible for the national level. At the national level, candidates were examined on their ability to analyze contemporary political problems, in addition to the usual examinations based on the Classics. An individual who succeeded in the national examination was raised to the level of jinshih (presented scholar). Occasionally, highly prestigious special examinations were held by imperial decree. 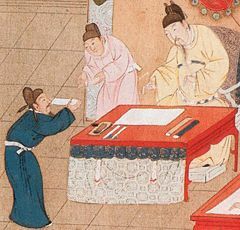 The success rate in the civil service examinations was low and restricted by regional quotas; during the Tang Dynasty the passing rate was about two percent. The personal suffering undergone by individuals in preparing for and taking the examinations has become part of Chinese folklore. Many candidates failed repeatedly, and some committed suicide because of the disgrace that their failure brought to their families. Others continued taking exams even when they became old, gray-haired men. The clans or families of those who rose through the ranks by passing these examinations also rose in social prestige and wealth. 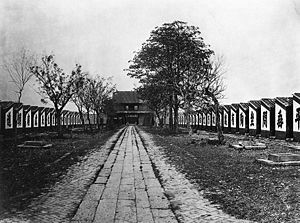 Examination hall with 7500 cells, Guangdong, 1873. Shēngyuán (生員), also called xiùcái (秀才), licentiate; administered at exams held in the county level each year. Jieyuan (解元) jǔrén who ranked #1. Jinshi jidi (進士及第) Jinshi who were ranked first class in Jinshi examiniation. Zhuangyuan (狀元), jìnshì who ranked #1 first class (in Jinshi examination) . Bangyan (榜眼), jìnshì who ranked #2 first class. Tanhua (探花), jìnshì who ranked #3 first class. Jinshi Chushen (進士出身) jìnshì who were ranked second class in Jinshi examination. Tong Jinshi Chushen (同進士出身) jìnshì who were ranked third class in Jinshi examiniation. The Chinese Imperial examination system had international influence throughout East Asia. It was copied by the Goryeo Dynasty and Joseon Dynasty for the Yangban class in Korea (see Gwageo) until its annexation by Japan. It was also copied in Vietnam from 1075 to 1919. Japan used a similar examination system during the Heian period for the promotion of minor nobles; it was replaced by the hereditary system in the Samurai era. It has been suggested that the Chinese Imperial examination system was an important influence on the Northcote-Trevelyan Report and hence on the reform of the Civil Service in British India and later in the United Kingdom. In the late nineteenth and early twentieth centuries, admission to the British civil service administration depended on success in an examination in classical studies. The Palace Examination was the final stage in the sequence of civil service recruitment examinations during the Qing Dynasty (1644-1911). This examination was prepared and presided over by the Emperor in person, and held in the Hall of Preserving Harmony in the royal palace. Those who passed the examination were awarded the title of Jin Shi (进士). 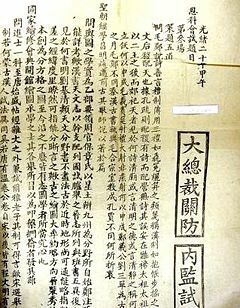 They would be selected in three categories, and the names of the successful candidates would be written on a sheet of yellow called the “Golden List” or “Yellow List.” There were two types of Golden Lists, a small one to be submitted to the Emperor, and a large one to be posted outside the Chang An Gates. The large Golden List was 150-220cm long and 80-90cm wide. It was written in both Chinese and Manchu, in Chinese ink, and stamped with the Emperor’s Seal. The Manchu language was written from left to right, while the Chinese was written from right to left. The two languages were joined in the middle of the paper by dates and the Manchu and Chinese character for the word List (榜). The paper began with an imperial command and followed with the name lists of successful candidates for each of the three categories. The Emperor’s Seal was put over the dates of the two languages and also where the papers’ edges met. Cords for anging were attached every meter along the upper edge of the paper. The small Golden List was 100cm long and 35 cm wide, the same as the large one in style and content, but without the Emperor’s seal on it. ↑ Chinese Imperial Examination System, Confucianism and the Chinese Scholastic System. California State Poly, Pomona. Retrieved August 24, 2007. ↑  California State Poly, Pomona. ↑ Ancient Imperial Exams with Modern Relevance, China.org.cn. Retrieved August 24, 2007. ↑ China - Golden Lists of the Qing Dynasty Imperial Examination, UNESCO. Retrieved August 24, 2007. History of "Imperial Examinations (Keju)"
This page was last modified on 8 April 2014, at 14:37.